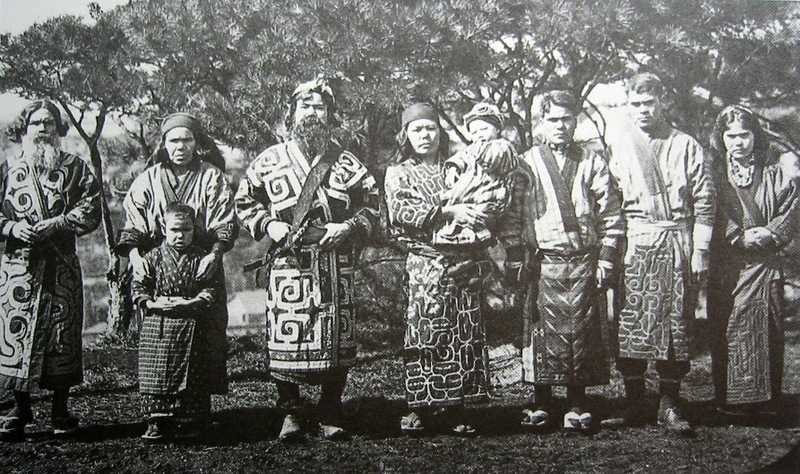 From our previous post “Ainu cloud motif and their creation myth of deity’s descent on five-colored cloud“, we traced the use of the cloud motif and symbolism in conjunction with deities or divinities, ancestors, sages and heroes to their early use both in art and in concepts in genealogies and myths of the peoples of the Northeast Eurasia or Far East. The yin-yang five agents principles and the related concept of “qi” which informed the ritual setting (temporal and geomantic) of the chinkonsai and the descriptive language of the law doctors, were fundamental, of course to Chinese philosophical thought. In Daoism, the induction of qi into the body and its proper regulation became one of the basic practices for achieving longevity, a central concern of later Daoist literature, as in Xiang’er’s commentary on the Daodejing, which also functioned as a guide to the enlightened ruler.58 thus in Bokenkamp’s paraphrase of one Xiang’er passage “the pneumas of morning and evening should be caused to descend into the human body , where they should be mixed with the body’s own pneumas so that they are evenly distributed throughout.” On the other hand, this time citing directly from the Xiang’er “When the heart produced ill-omened and evil conduct, the Dao departs, leaving the sack (belly) empty. Once it is empty, deviance enters, killing the person.”60 As these citations make clear, the principle of balacning and harmonizeing qu was of paramoutn importanecce; deviancce” (xie) on the other hand, arose from a a failure ot achieve a proper balacne or mixing o pnemas resulting in illlness and death. … The emphasis in the Xiang’er passage on the belly, for example, recalls what Watanabe characterizes as the peculiar language of the law commentaries where the aim of the rite was to draw the erring “tama” back into the “bowel“. A related notion found in the Chuxue ji, a Tang period encyclopedia compiled at the order of Emperor Xuangzong (r. 712-756), states that on the winter solstice the yang qi is restored to the belly and hot things placed in qi are easily digested.61 If this Daoist medical advice offers a parallel to the ideas of the law doctors in their attempts to describe the chinkon rite, recipes for the production of immortality elixirs provide a suggestive context for understanding the relationship between the medicinal herb and Temmu’s spirit-summoning rite. An entry from scroll seventy-seven on “elixirs” in Yunqi qiqian (Seven Lots from the Satchel of the Clouds), an encyclopedia of older Daoist texts and extracts compiled under the Northern Song, describes a life-extending elixir called lingwan that allows one to “pacify the cloud souls, coagulate the white souls, and fly off into the seventy-four directions,” and in another passage “to sport about on the Five Mountain Peaks.” Not least interesting here is the combination of graphs chinkon, “pacify the cloud souls”) the same two graphs that are used for the Japanese chinkon or “mitama-furi” rite. Another entry from the Inner Transmission of the Purple Sun Master (Ziyang zhenren neichuan, 399), collected in scroll 106 of the Yunji qiqian, relates that the consumption of zhu over a period of five years–the same medicinal herb ingested by Temmu–produces a glow in the body, gives one a vision that can see right through to the five viscera, and enables one to become an immortal. “The chief officiant counts eight times from one to ten, knotting the yufu each time. By tying knots in this symbol of the emperor’s life span, the officiant keeps his tama from slipping away. the eight times and eight knots refer to the eight musubi (binding) tama of deities. As one can see by these examples, the mitamashizume or chinkon-sai was a ritual means to fix the emperor’s tama so that it would not leave his body. the ancient Japanese greatly feared wandering tama and made the utmost efforts to affix them. A similar ceremony is still being carried out secretly each year at the Isonokami shrine (Renri City, Nara prefecture). This ritual may have to do partly with the Kyujiki, a text which gives much more importance to the Mononobe clan whose ancestral deity is enshrined at Isonokami, than the Kojiki and Nihon Shoki. The Taoist concept of soul summoning may have been transmitted via Korean immigrants, or directly by Chinese immigrants, or both. Tama(soul) Furi (shake) basic meaning is the self Chin-kon and relates directly to the furube-no-kamu-waza of Chinkon Saho. 1. Stand with your legs apart about shoulder width . 2. Place your hands together with the right hand over the left. Leave space between them big enough for an imaginary ping pong ball. 3. Place your hands in that position in front of your stomach and 0shake them vigorously up and down. 4. While shaking them concentrate and repeat the words: Harae-do-no-Okami – an invocation to the kami of the place of harai. The purpose of shaking the soul is to generate awareness of it within yourself. Kon, (the soul), in Shinto, is one of the four important elements along with Mei (life), Rei (spirit) and Ki (which means Spirit in its causal aspect – Ki is a kind of energy source). Kon is the most important of the four since human beings can also be described as Waketama (separated individual souls), which is another way of saying “children of the kami”. In Chinese art, an ancient cloud “meander” motif is related to the Hun and Po concepts of the afterlife. The cloud is a commonly seen design and when repeated in a pattern symbolizes never-ending fortune. Clouds, sometimes referred to as “auspicious clouds” (xiangyun 祥云), represent the heavens and also “good luck” because the Chinese word for cloud (yun 云) is pronounced the same as yun (运) meaning “luck” or “fortune”. Auspicious clouds may be seen on coins and charms or amulets. all are made of qi. including the three treasures: jing, qi and shen. including the seven apertures: two eyes, two ears, two nose holes, mouth. Therefore, we call them 3-Hun and 7-Po. In this way of viewing things, Po is associated with Yin. It is the more dense or physical of the two “spirits,” and is known also as the “corporeal soul,” since it returns to earth — dissolving into gross elements — at time of the time of the death of the body. Hun, on the other hand, is associated with Yang, since it is the more light or subtle of the two “spirits.” It’s known also as the “ethereal soul,” and at the time of death leaves body to merge into more subtle realms of existence. In the Tibetan Mahamudra tradition (associated primarily with the Kagyu lineage), a distinction is drawn between the “staying” and the “moving” aspects of mind. The “staying” aspect of mind refers more-or-less to what is sometimes also called the “witnessing” capacity. It is the perspective from which the arising and dissolving of various phenomena (thoughts, sensations, perceptions) is observed. It is the aspect of mind which has the capacity to remain (and is quite naturally) “continuously present,” and unaffected by the “objects” or “events” that arise within it. The “moving” aspect of mind refers to the various appearances which — like waves on an ocean — arise and dissolve. These are the “objects” and “events” that seem (at least initially) to have a space/time duration: an arising, an abiding, and a dissolution. As such, they seem to undergo change or transformation — in opposition to the “staying” aspect of mind, which is unchanging. A Mahamudra practitioner trains, first, in the capacity to toggle back and forth between these two (“staying” and “moving”) perspectives (known also as the “mind-perspective” and the “event-perspective”). And then, eventually, to experience them as simultaneously-arising and indistinguishable (i.e. nondual) — in the way that waves and ocean, as water, actually are mutually-arising and indistinguishable. The resolution of the moving/staying polarity, I would suggest, is basically equivalent (or at least opens the way for) the transcending of what Master Hu refers to as the tangible-consciousness/formless-consciousness polarity; and the absorption of the more densely-vibrating Po into the more subtle Hun. Or, to put it another way: the corporeal Po “serves” the ethereal Hun — in Taoist cultivation — to the extent that mind’s appearances become self-aware, i.e. conscious of their source & destination in/as the Hun — like waves becoming conscious of their essential nature as water. The Chinese characters 魂 and 魄 for hun and po typify the most common character classification of “radical-phonetic” or “phono-semantic” graphs, which combine a “radical” or “signific” (recurring graphic elements that roughly provide semantic information) with a “phonetic” (suggesting ancient pronunciation). Hun 魂 (or 䰟) and po 魄 have the “ghost radical” gui 鬼 “ghost; devil” and phonetics of yun 云 “cloud; cloudy” and bai 白 “white; clear; pure”. Besides the common meaning of “a soul”, po 魄 was a variant Chinese character for po 霸 “a lunar phase” and po 粕 “dregs”. The Shujing “Book of History” used po 魄 as a graphic variant for po 霸 “dark aspect of the moon” – this character usually means ba 霸 “overlord; hegemon”. For example, “On the third month, when (the growth phase, 生魄) of the moon began to wane, the duke of Chow [i.e., Duke of Zhou] commenced the foundations, and proceeded to build the new great city of Lǒ” (tr. Legge 1865:434). The Zhuangzi “[Writings of] Master Zhuang” wrote zaopo 糟粕 (lit. “rotten dregs”) “worthless; unwanted; waste matter” with a po 魄 variant. A wheelwright sees Duke Huan of Qi with books by dead sages and says, “what you are reading there is nothing but the [糟魄] chaff and dregs of the men of old!” (tr. Watson 1968:152). In the history of Chinese writing, characters for po 魄/霸 “lunar brightness” appeared before those for hun 魂 “soul; spirit”. The spiritual hun 魂 and po 魄 “dual souls” are first recorded in Warring States period (475–221 BCE) Seal Script characters. The lunar po 魄 or 霸 “moon’s brightness” appears in both Zhou Dynasty (1045–256 BCE) Bronzeware script and Oracle bone script, but not in Shang Dynasty (ca. 1600–1046 BCE) oracle inscriptions. The earliest form of this “lunar brightness” character was found on a (ca. 11th century BCE) Zhou oracle bone inscription (Yü 1987:370). The po soul’s etymology is better understood than the hun soul’s. Schuessler (2007:290, 417) reconstructs hun 魂 “‘spiritual soul’ which makes a human personality” and po 魄 “vegetative or animal soul … which accounts for growth and physiological functions” as Middle Chinese γuən and pʰak from Old Chinese *wûn and *phrâk. The (ca. 80 CE) Baihu Tang 白虎堂 gave pseudo-etymologies for hun and po through Chinese character puns. It explains hun 魂 with zhuan 傳 “deliver; pass on; impart; spread” and yun 芸 “rue (used to keep insects out of books); to weed”, and po 魄 withpo 迫 ” compel; force; coerce; urgent” and bai 白 “white; bright”. Etymologically, Schuessler says pò 魄 “animal soul” “is the same word as” pò 霸 “a lunar phase“. 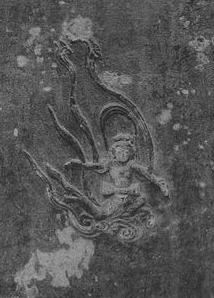 He cites the Zuozhuan (534 BCE, see below) using the lunar jishengpo 既生魄 to mean “With the first development of a fetus grows the vegetative soul”. Lunar associations of po are evident in the Classical Chinese terms chanpo 蟾魄 “the moon” (with “toad; toad in the moon; moon”) and haopo 皓魄 “moon; moonlight” (with “white; bright; luminous”). The semantics of po 魄 “white soul” probably originated with 霸 “lunar whiteness”. Zhou bronze inscriptions commonly recorded lunar phases with the terms jishengpo 既生魄 “after the brightness has grown” and jisipo 既死魄 “after the brightness has died”, which Schuessler explains as “second quarter of the lunar month” and “last quarter of the lunar month”. Chinese scholars have variously interpreted these two terms as lunar quarters or fixed days, and (Shaughnessy 1992:136–145) Wang Guowei‘s lunar-quarter analysis the most likely. Thus, jishengpo is from the 7th/8th to the 14th/15th days of the lunar month and jisipo is from the 23rd/24th to the end of the month. Yü (1987:370) translates them as “after the birth of the crescent” and “after the death of the crescent”. Etymologically, lunar and spiritual po <pʰak < *phrâk 魄 are cognate with bai < bɐk < *brâk 白 “white” (Matisoff 1980, Yü 1981, Carr 1985). According to Hu Shih (1946:30), po etymologically means “white, whiteness, and bright light”; “The primitive Chinese seem to have regarded the changing phases of the moon as periodic birth and death of its [po], its ‘white light’ or soul.” Yü (1981:83) says this ancient association between the po soul and the “growing light of the new moon is of tremendous importance to our understanding of certain myths related to the seventh day of the months.” Two celebrated examples in Chinese mythology are Xi Wangmu and Emperor Wu meeting on the seventh day of the first lunar month and The Princess and the Cowherd or Qixi Festival held on the seventh day of the seventh lunar month. The etymology of hun < γuən < *wûn 魂 is comparatively less certain. Hu (1946:31) said, “The word hun is etymologically the same as the word yun, meaning “clouds.” The clouds float about and seem more free and more active than the cold, white-lighted portion of the growing and waning moon.” Schuessler cites two possibilities. Both Chinese hun and po are translatable as English “soul” or “spirit“, and both are basic components in “soul” compounds. In the following examples, all Chinese-English translation equivalents are from DeFrancis (2003). Hunpo and linghun are the most frequently used among these “soul” words. Based on Zuozhuan usages of hun and po in four historical contexts, Yü (1987:370) extrapolates that po was the original name for a human soul, and the dualistic conception of hun and po “began to gain currency in the middle of the sixth century” BCE. Two earlier 6th century contexts used the po soul alone. Both describe Tian 天 “heaven; god” duo 奪 “seizing; taking away” a person’s po, which resulted in a loss of mental faculties. In 593 BCE (Duke Xuan 15th year, tr. Legge 1872:329), after Zhao Tong 趙同 behaved inappropriately at the Zhou court, an observer predicted: “In less than ten years [Zhao Tong] will be sure to meet with great calamity. Heaven has taken his [魄] wits away from him.” In 543 BCE (Duke Xiang 29th year, tr. Legge 1872:551), Boyou 伯有 from Zheng (state) acted irrationally, which an official interpreted as: “Heaven is destroying [Boyou], and has taken away his [魄] reason.” Boyou’s political enemies subsequently arranged to take away his hereditary position and assassinate him. When a man is born, (we see) in his first movements what is called the [魄] animal soul. [既生魄] After this has been produced, it is developed into what is called the [魂] spirit. By the use of things the subtle elements are multiplied, and the [魂魄] soul and spirit become strong. They go on in this way, growing in etherealness and brightness, till they become (thoroughly) spiritual and intelligent. When an ordinary man or woman dies a violent death, the [魂魄] soul and spirit are still able to keep hanging about men in the shape of an evil apparition; how much more might this be expected in the case of [Boyou]. … Belonging to a family which had held for three generations the handle of government, his use of things had been extensive, the subtle essences which he had imbibed had been many. His clan also was a great one, and his connexions [sic] were distinguished. Is it not entirely reasonable that, having died a violent death, he should be a [鬼] ghost? Compare the translation of Needham and Lu (1974:86), who interpret this as an early Chinese discourse on embryology. Silk painting found in the (168 BCE) tomb of Lady Dai at Mawangdui, interpreted (Yü 1987:367) as depicting her hun soul ascending to heaven and her family performing the zhaohun“summoning the soul” ritual below. Soon after death, it was believed that a person’s hun and po could be temporarily reunited through a ritual called the fu 復 “recall; return”, zhaohun 招魂 “summon the hun soul”, or zhaohun fupo 招魂復魄 “to summon the hun-soul to reunite with the po-soul”. The earliest known account of this ritual is found in the (3rd century BCE) Chu Ci poems Zhaohun 招魂 “Summons of the Soul” and Dazhao 大招 “The Great Summons” (Csikszentmihalyi 2006:140–141). For example, Wu/Shaman Yang 巫陽 summons a man’s soul in Zhaohun. O soul, come back! Why have you left your old abode and sped to the earth’s far corners, deserting the place of your delight to meet all those things of evil omen? The identification of the yin-yang principle with the hun and po souls evidently occurred in the late fourth and early third centuries BCE (Yü 1987:374), and by “the second century at the latest, the Chinese dualistic conception of soul had reached its definitive formulation.” The Liji (11, tr. Legge 1885:444) compounds hun and po with qi “breath; life force” and xing “form; shape; body” in hunqi 魂氣 and xingpo 形魄. “The [魂氣] intelligent spirit returns to heaven the [形魄] body and the animal soul return to the earth; and hence arose the idea of seeking (for the deceased) in sacrifice in the unseen darkness and in the bright region above.” Compare this modern translation (Yü 1987:374), “The breath-soul (hun-ch’I 魂氣) returns to heaven; the bodily soul (hsing-p’o 形魄) returns to earth. Therefore, in sacrificial-offering one should seek the meaning in the yin-yang 陰陽 principle.” Yü summarizes hun/po dualism. Loewe (1979:9) explains with a candle metaphor; the physical xing is the “wick and substance of a candle”, the spiritual po and hun are the “force that keeps the candle alight” and “light that emanates from the candle”. The Yin po and Yang hun were correlated with Chinese spiritual and medical beliefs. Hun 魂 is associated with shen 神 “spirit; god” and po 魄with gui 鬼 “ghost; demon; devil” (Carr 1985:62). The (ca. 1st century BCE) Lingshu Jing medical text spiritually applies Wu Xing “Five Phase” theory to the Zang-fu “organs”, associating the hun soul with liver (Chinese medicine) and blood, and the po soul with lung (Chinese medicine) and breath. Jade burial suits were believed to delay the bodily po soul’s decomposition. During the Han Dynasty, the belief in hun and po remained prominent, although there was a great diversity of different, sometimes contradictory, beliefs about the afterlife (Hansen 2000:119; Csikszentmihalyi 2006:116–117, 140–142). Han burial customs provided nourishment and comfort for the po with the placement of grave goods, including food, commodities, and even money within the tomb of the deceased (Hansen 2000:119). Chinese jade was believed to delay the decomposition of a body. Pieces of jade were commonly placed in bodily orifices, or rarely crafted into jade burial suits. The sanhunqipo 三魂七魄 “three hun and seven po” were anthropomorphized and visualized. Ge Hong‘s (ca. 320 CE) Baopuzi frequently mentions the hun and po “ethereal and gross souls”. The “Genii” Chapter argues that these dual souls cause illness and death. This “magicians” translates fangshi 方士 “doctor; diviner’ magician”. Both fangshi and daoshi 道士 “Daoist priests” developed methods and rituals to summon hun and po back into a person’s body. The “Gold and Cinnabar” chapter records a Daoist alchemical reanimation pill that can return the hun and po souls to a recent corpse: Taiyi zhaohunpo dan fa 太乙招魂魄丹法 “The Great One’s Elixir Method for Summoning Souls”. For visualizing the ten souls, the Baopuzi “Truth on Earth” chapter recommends taking dayao 大藥 “great medicines” and practicing a fenxing 分形 “divide/multiply the body” multilocation technique. The number of human “souls” has been a long-standing source of controversy among Chinese religious traditions. Stevan Harrell (1979:521) concludes, “Almost every number from one to a dozen has at one time or another been proposed as the correct one.” The most commonly believed numbers of “souls” in a person are one, two, three, and ten. One “soul” or linghun 靈魂 is the simplest idea. Harrell gives a fieldwork example. Ten “souls” of sanhunqipo 三魂七魄 “three hun and seven po” is not only Daoist; “Some authorities would maintain that the three-seven “soul” is basic to all Chinese religion” (Harrell 1979:522). During the Later Han period, Daoists fixed the number of hun souls at three and the number of po souls at seven. A newly deceased person may return (回魂) to his home at some nights, sometimes one week (頭七) after his death and the seven po would disappear one by one every 7 days after death. According to Needham and Lu (1974:88), “It is a little difficult to ascertain the reason for this, since fives and sixes (if they corresponded to the viscera) would have rather been expected.” Three hun may stand for the sangang 三綱 “three principles of social order: relationships between ruler-subject, father-child, and husband-wife” (Needham 1974:89). Seven po may stand for the qiqiao 七竅 “seven apertures (in the head, eyes, ears, nostrils, and mouth)” or the qiqing 七情 “seven emotions (joy, anger, sorrow, fear, worry, grief, fright)” in traditional Chinese medicine (Baldrian-Hussein 2008:522). Sanhunqipo also stand for other names. Chinkon is still a revived Shinto practice today in Japan, as a soul-binding or soul-summoning procedure or rite for healing (an ancient shamanic calling back the wandering soul spirit) Chinkon kishin and as a ‘Chinkon’ (‘Pacifying and Deepening the soul’ exercise, which is “a quiet journey into the interior. This involves meditation, and focusing on specific mental images. These three elements, purification, spiritual movements, and meditation, are the bases of Shinto training” see Green Shinto’s “Spiritual exercises: misogi, furitama and chinkon” article. The chinkon ritual practice was revived by Shinto scholar Honda Chikaatsu who based the practice on the Chinkonsai court ritual and the Kojiki account of Okinaga Tarashi Hime’s medium spirit possession, see Birgit Staemmler’s “Chinkon Kishin: Mediated Spirit Possession in Japanese New Religions” at p 117. The cloudsoul hun, we theorize, was likely a far older motif of Northeast Asia from prehistoric times, as the cloud spirals are a common motif in ceramics of the prehistoric Jomon people of Japan as well as the Amur populations(see Ainu cloud motif), although interpretations lend themselves variously to both solar as well as cloud symbols. As a pre-Hun and proto-Tartar-Mongol belief, cloud-symbol-associated sky, storm and thunder god beliefs likely spread westwards influencing early Indo-European and Anatolian populations as well as all of East Asian civilization, see Jacqueline Taylor Basker’s, “The Cloud as a Symbol“. Cloud symbolism is given detailed treatment in Camman Schuyler’s article “The Symbolism of the Cloud Collar“, The Art Bulletin, Vol. 33, No. 1 (Mar., 1951), pp. 1-9 URL: http://www.jstor.org/stable/3047324, as well as Hubert Damisch’s “A Theory of Cloud: Toward a History of Painting“. In The Language of Kilim of Anatolia, Uzeyir Ozeyurt showed that Mongolian princes of Hitay and Anatolian Hittite village weaving used the same fertility motifs, and that many basic motifs are shared between East and West, including cloud spiral and storm/thunder meander patterns. We may surmise that while the cloud-soul meaning was lost during the cloud motif’s diffusion westwards, cloud symbolism associations with a divinity’s descent, and particularly that of sky-storm gods, remained.